There are certainly countless literary companions to the fifty six short stories and four novels comprising the canon of Sir Arthur Conan Doyle's famous "consulting detective." And fittingly, there are plenty of general references, and a few extensive articles, relating to the many pipe and tobacco-related reference guides to the exploits of the venerated briar-loving crime solver. 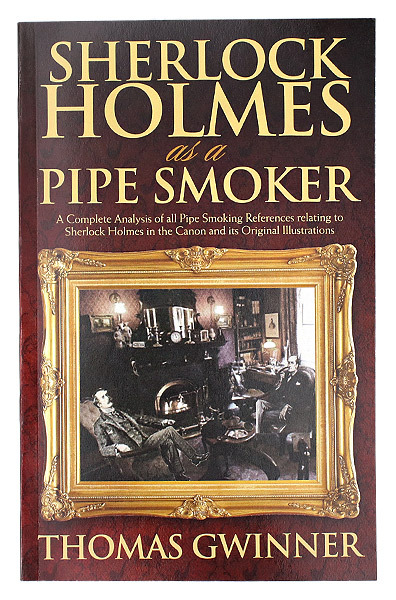 Thomas Gwinner's Sherlock Holmes as a Pipe Smoker offers a complete analysis of all pipe smoking references relating to Holmes' own consumption, broken down into four categories: pipes, tobacco, place and time of daily smoking. Included within are original illustrations from the first English editions of each pipe discussed, as well as close existing representation of each piece, all meticulously researched and cross referenced against existing sources. If you're a pipe smoker, Holmes aficionado, or both, you'd be remiss to not add this text to your library or smoking lounge. The author did his research and gives it back stone cold. Truly a reference book, but could (and should) have been condensed into maybe a 6-10 page paper or magazine article. My rating is in reference to the presentation of the book here. Amazon.com offers a much more extensive description, including the information, omitted here, that the book contains 106 pages.